I never wanted to become an EcoManiac. 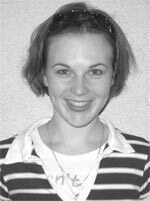 I was busy living the good life of an ordinary teacher of English, complete with retail therapy1 after irregular working hours at school. And when, for the umpteenth2 time, I kept my window open while air conditioning was on and left the water running while I brushed my teeth, who knew I was an accomplice3 in the murder of the planet? Now that climate change has become a reality, I’m trying to learn more and do my bit4. Current project is my first attempt to share my views on sustainability5, the environment, organics and Earth friendly alternatives. This time I’ll tell you about eco-friendly architecture which is not just money-saving, but even has an aesthetic beauty. A good example of it is the Bird’s Nest stadium in Beijing. Unlike the mechanistic buildings Eco-Architecture replaces, it is in harmony with nature, including its immediate environs6. Decisions have to be taken on ecological grounds concerning locations, siting7 and orientation, as well as the well informed choice of materials. Eco-Architecture makes every effort to minimise the use of energy at each stage of the building’s life cycle, including that embodied8 in the extraction and transportation of materials, their fabrication, their assembly9 into the building and ultimately the ease and value of their recycling when the building’s life is over. The design may also take into consideration10 the use of energy in building maintenance and changes in its use, not to mention its lighting, heating and cooling, particularly where the energy consumed involves the emission of greenhouse gases11. Substantial savings can be achieved by passive energy systems, especially natural ventilation, summer shading and winter solar heat gain. Solar energy may be used in panel pipes for heating water and photovoltaic cells12. The development of Eco-Architecture is driven by the depletion13 of natural resources, especially fossil fuels14 and the need to preserve the balance of nature. The extensive use of steel and glass and the built-in problems of discomfort from solar over-heating and winter heat loss, has led to the widespread use of mechanical systems. Eco-Architecture is providing instead imaginative and expressive solutions driven by a generation of highly creative designs. It has important cultural as well as architectural impacts15. Eco-Architecture is by definition inter-disciplinary; it requires the collaboration of engineers, planners16, physicists, sociologists, economists, and other specialists, in addition to architects. The spectacular Bird’s Nest stadium is hailed17 as the finest arena in the world and the centrepiece of the most expensive Olympics in history. The unique architecture and design of the building has made it an iconic focal18 point for Beijing. 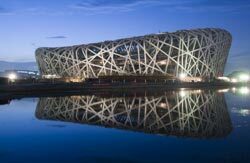 The stadium is referred to as the ‘Bird’s Nest’ because of its saddle-shaped steel roof and interwoven faзade. Viewed from a distance, the contrast between its bent steel columns and its bulging elliptical form gives the stadium a surreal, moody appearance, as if it were straining to contain the forces that are pushing and pulling it this way and that. It comprises an outer skeleton of 42,000 tons of steel, making it three times as heavy as the proposed London 2012 stadium, and an inner ‘skin’ of double-layered plastic which keeps out wind and rain and filters out UVA19 light. The very irregular nature of the structure meant looking for new methods of designing structural steel sections in order to minimize the weight. Its upper surface is clad with ethylene tetra fluoro ethylene (ETFE) panels which let in natural light and its lower surface has an acoustic membrane which reflects and absorbs20 sound. This maintains the atmosphere in the stadium. Its architects also claim it is one of the most environmentally-friendly stadiums in the world. The eastern and western stands of Beijing National Stadium are higher than northern and southern stands, in order to improve sightlines21. A 24-hour per day rainwater collector is located near the stadium; after water is purified, it is used throughout and around the stadium for irrigation and to flush22 lavatories. Undersoil geothermal pipes placed under the playing surface gather heat in the winter to warm the stadium and coldness in the summer to cool the stadium. Temperature and airflow of every surface were optimized to increase ventilation. It is designed to last for 100 years and withstand a force eight magnitude earthquake23.